Venti nuove composizioni, venti diverse formazioni per eseguirle: è la presentazione del terzo ciclo zorniano del Masada Songbook, The Book Beriah. In anteprima stasera, alla Town Hall di New York. An epic event featuring 20 new compositions by 20 different ensembles in one marathon evening - all performed for the first time. One of the most important composers and musicians of his generation, John Zorn has spent two decades building upon his exceptional Masada Songbook, now comprising 613 compositions. 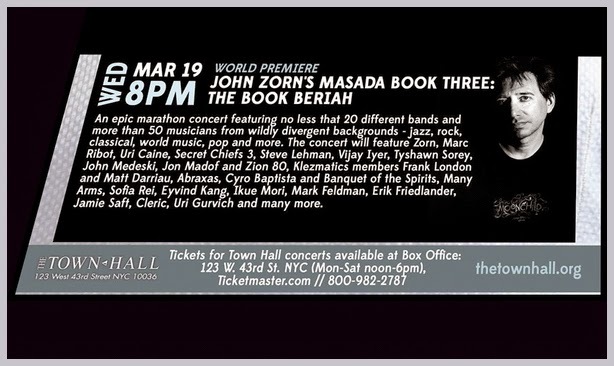 The world premiere of John Zorn’s Masada Book Three: The Book Beriah is the newest addition to Zorn’s ongoing work and the last in the series, following 1993’s Masada Book One and 2004’s Masada Book Two: The Book of Angels. The newest Masada songs will be presented in a special marathon “shuffle” concert featuring no less that 20 different bands and more than 50 musicians from wildly divergent backgrounds - jazz, rock, classical, world music, pop and more. The premiere of The Book Beriah (Beriah means World of Creation) will be an unforgettable evening of new Jewish music that runs the gamut of emotions, influences and styles. The Book Beriah will feature John Zorn, Marc Ribot, Uri Caine, Secret Chiefs 3, Steve Lehman, Vijay Iyer, Tyshawn Sorey, John Medeski, Jon Madof and Zion 80, Klezmatics members Frank London and Matt Darriau, Abraxas, Cyro Baptista and Banquet of the Spirits, Many Arms, Sofia Rei, Eyvind Kang, Ikue Mori, Mark Feldman, Erik Friedlander, Jamie Saft, Cleric, Uri Gurvich and many more.